View of “Fernanda Gomes,” 2012. The Pavilhão Branco is a two-floor pavilion located in the garden of the city museum in Lisbon. It has white walls, high ceilings, yellowish floors, and large glass windows that overlook the grounds. Fernanda Gomes used the specificities of its architecture to determine the installation of her exhibition: All of the pavilion’s space (inside and out) is incorporated and becomes a landscape of events. For example, Gomes inserted a small pointy stick of wood into an existing fissure in the gallery floor. What used to be a barely visible imperfection is transformed into a sculpture and floor drawing of sorts. The exhibition includes around sixty pieces, all made with everyday, ordinary objects such as threads, plastic bags, pieces of wood, stones, old books, bottles, wires, glasses, paper boxes, and unused art fine-materials like blank canvases or drawing paper. Some of the artworks are presented as simple readymades—found objects shown in their original condition; in other cases the materials are painted white (the only artificial color used by the artist), and frequently combined with one another. And while some works existed prior to the exhibition, even more were done in the process of installing. In her walks in Lisbon, Fernanda Gomes would stumble upon many of these things, detritus to most of us, but for her, potential sculptures. For the three weeks prior to her exhibition, Gomes inhabited the space as if it were her studio. She transformed it into a place of creation. 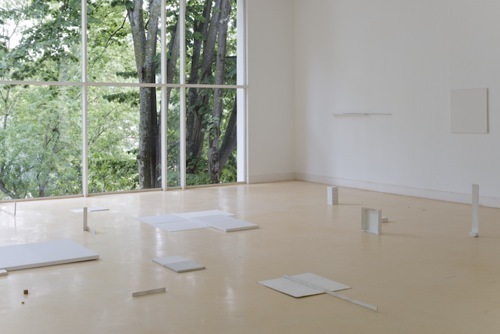 For this artist, an exhibition is not simply the placing of pieces in a venue, but a process of discovering the space, of the works, and of the perfect equilibrium between the two—as well as the body of the spectator, who becomes not only an observer but also a witness of an unrepeatable experience.